Submitted photos Chef Gary O’Brien instructs students during the first culinary supervisor class at One Bistro. The class allows participants to receive a high school diploma and earn ServSafe certification. 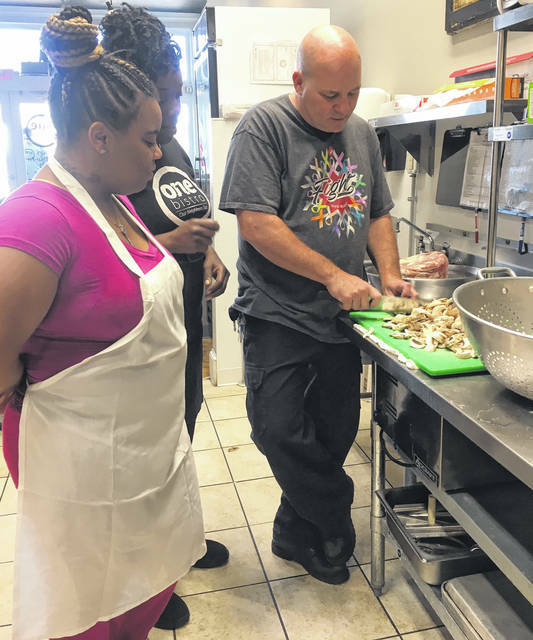 XENIA — One Bistro in Xenia is helping adults earn a diploma and learn needed skills to be successful in food service. Through a partnership with the Miami Valley Career Technology Center and the state’s Aspire program, the “pay what you can” restaurant downtown is hosting an eight-week class where adult students learn to safely prepare and serve food, earn ServSafe certification and receive their high school equivalency, commonly known as the GED. Taught by MVCTC instructor Gary O’Brien — who has decades of experience as a chef — the next class begins Monday, April 1 and covers everything an aspiring chef will need to know. 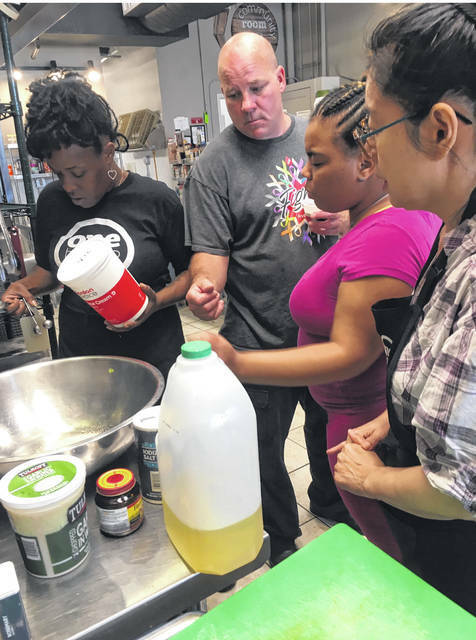 There is also also a class at the Job Center in Dayton, but the class at One Bistro is more beneficial as students receive practical, hands-on experience. O’Brien said anyone can learn to crack and egg, but learning to do it during a lunch or dinner rush is totally different. Mondays are spent learning food safety, while Tuesdays are dedicated to food prep for One Bistro. Wednesdays and Thursdays, when One Bistro is open, the students cook food and perform other operational tasks. O’Brien requires students to work at least four Saturdays and several Fridays as well. “You have to be able to throw an egg Friday or Saturday,” he said. A long friendship between O’Brien and One Bistro owner Robert Adamson led to the collaboration. “I heard of his mission, I thought I could be a lot of help to him,” O’Brien said. One Bistro officials were happy to offer the space, free of charge as all involved benefit. Graduates of the class have found employment at Reynolds and Reynolds, the Dayton Marriott, Fairborn City Schools, and Heartland of Beavercreek, among others. For more information or to register for the class, call 937-854-6490.
https://www.xeniagazette.com/wp-content/uploads/sites/32/2019/03/web1_IMG_0672.jpgSubmitted photos Chef Gary O’Brien instructs students during the first culinary supervisor class at One Bistro. The class allows participants to receive a high school diploma and earn ServSafe certification. https://www.xeniagazette.com/wp-content/uploads/sites/32/2019/03/web1_IMG_0670.jpgSubmitted photos Chef Gary O’Brien instructs students during the first culinary supervisor class at One Bistro. The class allows participants to receive a high school diploma and earn ServSafe certification.